My thoughts on being a husband, father, Christian, citizen, Career Educator, naturalist and whatever else comes up. Trusting God is the only reason this happened. Most of you know that less than two years ago I was desperate to get rid of our house in Noblesville, Indiana. 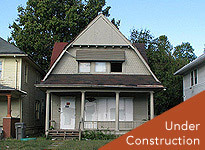 Thus, you're probably confused as to why we are moving forward with purchasing a home again. Especially after I swore it off in the past. My first answer is, "it's me!" so you shouldn't be that surprised. There were so many thing wrong with living in Noblesville for us. I hate yard work, so why did I purchase a home with a GIANT yard? It wasn't really a place we felt like we could 'live' because most of our 'living' took place in a car getting from place to place. We were never settled there. Even before we purchased the home we knew we were going to move in the near future. At the time, we thought it would be 5 years or less. We didn't want to 'throw our money away' renting, so instead we decided to throw a whole bunch more money away purchasing a home. We didn't pray through any of it, we just acted. Those are just a few of the reasons it wasn't a good fit for us. Luckily, The Eriksen Group was good and got us out with as little financial damage as possible. We then moved into what seemed like The Palace on College Ave. Compared to the Barbee on Penn, the Walbrook was a palace. In the picture, our apartment is on the second floor on the corner of the street. This apartment added a few sq ft and had excellent walkability to Mass Ave. The Monon was across the street and the cultrual trails were a few blocks south. It, unfortunately, is just like all the other Zender properties, but the price was good. We anticipated staying here for two years when we moved there, but that all began to change. Earlier this year, Mark Vroegop recommend that I read a book about the future grace of God and how trusting His past provision was evidence enough to trust Him for future provision. Heidi and I began to surrender several aspects of our lives, including our finances. In all the ups and downs, God provided. We prayed about what God wanted our family to do with our time, money, career, and for the first time, where to live. Enter the Abels! I met Joshua at my son's Sunday school class and we discovered we both lived downtown. He and Laurie are very persuasive, and, before we knew it, Heidi and I were looking at houses in St. Clair Place. Heidi and I kept praying and life circumstances seemed to lead us to believe it was worth considering. I fixated on a rather large house that was amazing on the inside. It had beautiful wood work, large and great lay out, and the option to finish the 3rd floor to add even more space. It did, however, have a very creepy basement. 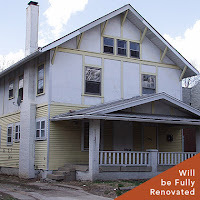 The original anticipated price of the house was at the top end of the payment Heidi and I were comfortable with, so it seemed like a great option. We visited the house a few times and I was basically set on purchasing it. Heidi had a reservation, mainly because she was fixated on another property. She was partial to the 'Dutch Colonial' home with the incredible wood work and stair case. It was slightly smaller than the house I liked but was still very good size. The basement also had the option to be finished! It would have been a great option. The anticipated price was also in our range, but then the prices went up. The one I wanted ended up going up in price a possible $15,000. So Heidi's seemed to be a great option but this time I had the reservation. I figured that if my house was going up, so would this one and both would be out of our price range. I started to get really discouraged because purchasing didn't seem like an option. Heidi and I continued in prayer and I tried to keep my spirits up and hoped in God's future provision. There was a home tour shortly after and we decided to revisit some of the houses we went to with Elaine the first day we looked. When she met with us, she told us right away that God was going to lead us to the right house. Her faith was encouraging! 902 was the second house we went to and Elaine mentioned how much natural light came in through the windows. Heidi and I loved it, too but it didn't seem to have the character we liked in the other homes. When we went it, it was all white and looked like new construction. When we went back on the home tour, the kitchen was in better shape and was reason enough to purchase the home! It was still a little smaller than we thought we would purchase, but it wasn't off the table. The day of the home tour was the first day the house was officially on the market. We went to another house to visit with Jay Pearl, a listing agent in the neighborhood. He seemed to be very excited about the listing price and mentioned he recommended that they bump out the back a little as a room addition. What a great idea! Heidi and I went home and her calm plan was to make a pro-con list of the 3 homes, while my plan was to pace and be anxious. She started writing down notes on each of the homes but we both had reservations about 806 and 838. God kept leading us back to 902 and the option of a room addition made all the difference (thank you, Jay). The two larger homes were of interest as a 'if you build it they will come' kind of thing. The idea was that our family would be able to grow into those homes. 902 fit our current family plus a few more, and if it got too small, could have an addition. The price was great, the renovations beautiful, the kitchen amazing, the location incredible, and it seemed that Elaine was right, God did lead us to the right house. So why is this a good option? We prayed and God appears to have said, YES. It was a much toned down financial decision. The neighborhood isn't perfect, but that is part of why we love it. We don't exactly have to sign up to 'serve' with our church because we will pretty much be doing it daily. We lose a little walkability, to the glory of Mass Ave, but we are close to two major bus lines and can still bike downtown. I can still bike to work (will take about 25 minutes) or take the bus. The yard is small!!! Yard work may take 30 minutes a week! We have lived in the area for a while and we want to settle downtown. Speaking of settling, our mindset going in is not 'what will we do next,' but that we really want to plant ourselves here for a long time. Lord willing, employment options will remain close to our home. So I did swear off home ownership, and I still believe that it isn't for everyone! It is not an investment as many people make it out to be. You're lucky if you do make money, but I don't see that happening any time soon. You probably should rent in an area you're thinking of moving to before you move there. If you're planning a career or job change, don't buy. If you think you might move in 5-8 years, don't buy. Know yourself and what you want in a house and yard. Don't let conventional wisdom guide you, let God. I don't regret living in Noblesville, but I probably wouldn't do it again. We had some good neighbors. If we didn't own that place, we probably wouldn't of had kids when we did. My biggest regret would have been not having Edmund and Mildred. God provided through that whole time and taught us a bunch. So there you have it. 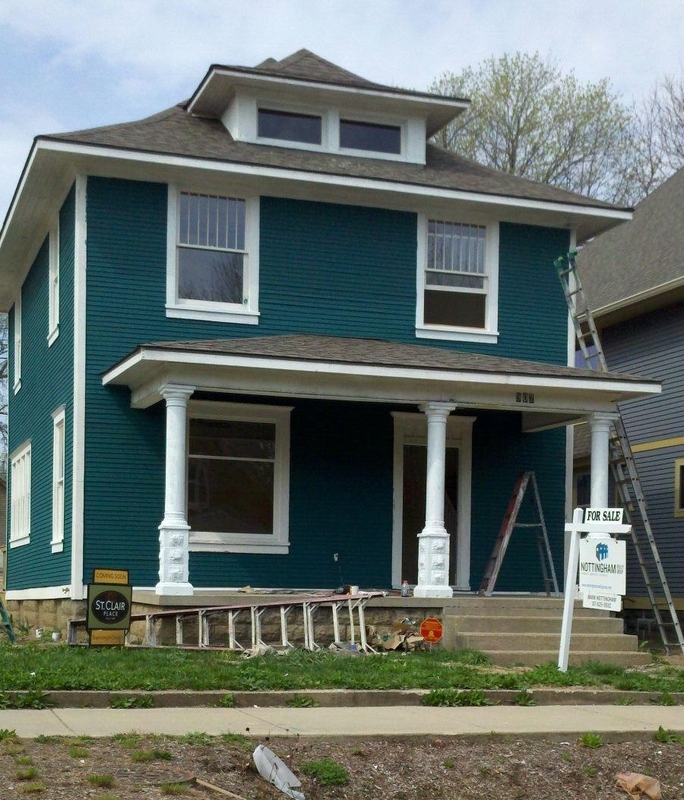 We plan to close on the house June 1 and move in shortly after. Who wants to help? My major take away from today's meeting: Eat it if you can enjoy it. I believe it was in the context of the yo-yo thing where people fall away from their good habits but then go back to them. I guess there were some people who fell away or were struggling over the week to stay within points. Instead of avoiding the foods we love we need to treat ourselves. When we run out of points and something we love is staring at us, we need to eat it if we enjoy can enjoy it, meaning eat it without guilt or worring about points. I did that very thing this week. I enjoyed a lovely dinner at Bazbuex's Pizza, a wonderfil Caramel Macchiato (actually made correctly, way to go Mass Ave Starbucks), a fun lunch at Red Robin and enjoyed several snacks like chips and choclate. On the flip side, I did a ton of walking and did a few WII step workouts. Those workouts don't earn a bunch of activity points, but it was better than nothing. Even though I ate all my 49 weekly and only a few of my activity points, I still lost 1.6 pounds! I am hoping that in two more weeks I will be at my 10% goal! I think this week I am going to concentrate on more vegetables and a little less Diet Coke. I am also going to attempt to not eat any of my weekly flex points and only eat activity points. We'll see how it goes! I stayed away from Weight Watchers because I was told it was 'fat girls with no friends.' Or, in light of "Mean Girls"... 'girls who eat their emotions.' Regardless of who is there, I'm glad I joined (thus far). My leader speaks my language! "Treat yourself" "Enjoy that candy bar" but also "track your points" "know what you're eating" "we are not on a diet!" I haven't read all the materials yet, but as of my 3rd week weigh in, I've lost 12.4 pounds. I'm excited to see what next week brings as I've been doing a lot of walking and haven't eaten my weekly free points. Anyway - I love it. It is like economics. A basic economic concept is Opportunity Cost. With limited resources you have to choose one thing over the other (the thing you didn't choose is your opportunity cost.) I get my points each week, plus my flex points (or whatever they're called) and thats what I get to spend on food. I thought I was going to die the first week but it turns out my stomach shrank and I'm not craving food as much. Or it could be that I'm taking full advantage of my Zero Point Foods like fruits and most veggies and I'm binging on those whenever I'm hungry. Either way, it has been working. Each week I've focused on a few different habits. Stay within points no matter what! This meant a lot of SmartOnes, fruit and Diet Coke. I told Heidi she was just going to have to deal with me drinking a lot of DC until I got other things under control. Stay Within Points... drink more water, less Diet Coke, walk to earn activity points and take vitamins. Still working on last weeks goals. I have walked a lot and have only used 2 of my 49 flex points so far! I will see on Monday if I'm still losing. I hear you lose a lot of weight really fast and then it slows. Hopefully with my goals of staying away from flex points and walking a bit I can keep shrinking. I made my 5% goal in three weeks.. maybe I can do my 10% in another 3! :-) I doubt it, but we'll see. 30 points for dinner tonight... maybe pizza!?!? My church started reading David' Platt's Radical several months ago. I, of course, am just not getting around to it. I read through chapter 1 and 2 tonight and I'm shockingly hopeful for the book. It is so confusing to be a believer in Christ because it seems like everyone has their own take, especially in America. I remember when I came back from Kenya and I felt like everything Christian in America was fake. I went through the slums on Nairobi and couldn't wrap my mind around why the government wasn't doing anything. It occurred to me that there was no such thing as social services there that the only shot these people had was the Church. Even now when I look around in Indianapolis, some of the best hospitals were started by churches many moons ago when the Church went to the aid of others, not the government. Heidi and I have been through many stages of revolt of American Ideals. A few years ago, what actually started the blog, we our year without buying anything. We did well for almost 9 months and then we were pregnant with Edmund and had to buy a few things here and there. I have been told my a few of my past mentors that I have a rebellious streak in me, which is probably why I'm a fan of some authors like Rob Bell and Donald Miller. Regardless of what people say about Rob Bell, I find his teachings encouraging. In fact, Velvet Elvis was used by God to keep me keeping on the path. (U2 songs have also been used but that's another post.) There is some controversy surrounding the book but the ultimate message was so encouraging to me. I found a place where it was okay to ask questions and not have all the right answers. I found that what Rob says isn't some new revelation but the revelation of old. It appears to be what a Jew back in the day would have understood things to mean, not what an American would take things to mean. I obviously appreciate the way he takes those ancient applications and makes them relevant to my life. So Chapter 1 Someone Worth Losing Everything For was a great introduction, however everything was lost on me because I kept thinking that his exhortation isn't applicable. All I kept thinking about when he was talking about people selling everything and following Christ was that no one in America could do that. I couldn't, unless by some act of grace all of my debt was paid off. Most Americans could sell everything they 'own' and still not have enough money to break even so that they could take up their cross. I found myself in this situation with purchasing a house. Its a long story but what was a good plan changed over time and the original plan wasn't good with the changes so we ended up being trapped in a house and lost a spot of money. I don't want to limit God's capabilities but even when we did get out from the house, we still didn't have the financial flexibility to do something 'radical.' God had just the right high maintenance realtor for us and the house sold just before our ruin. I guess my point is that it wouldn't it be radical of Christians stopped borrowing money? What if we only bought houses and cars with cash? What if we didn't use credit cards and finance stuff? That right there would probably cut down on the fancy stuff Platt mentions American Christians enjoying. So now that I am in the position to make real progress on past mistakes, do I do that or tithe? I heard a pastor from Grand Rapids, Michigan, once tell his congregation that if they were in credit card debt (or other debt) that their service to the church was to get out of debt and to not worry about tithing. Heidi and I have had several rounds on this. We both desire to be generous towards others (like Kyle) but we just don't have the means. However, if we didn't have our monthly debt payments, we could be VERY generous. This is going into a whole other topic of finances but my point is that I wish he would have touched on the area of finances just a bit. Chapter 2: Too Hungry for Words was much more encouraging. I've been discouraged for years about the Gospel sharing I heard was going on. I was taught all kind of interesting ways to manipulate a conversation so that I could get God in there. If I were truly on fire for God, would I have to manipulate a conversation or would it just be leaking out all over? "The Modern-day gospel says, "God loves you and has a wonderful plan for your life. Therefore, follow these steps, and you can be saved." Meanwhile, the biblical gospel says, "you are an enemy of God, dead in your sin, and in your present state of rebellion, you are not even able to see that you need life, much less to cause yourself to come to life. Therefore, you are radically dependent on God to do something in your life that you could never do. The former sells books and draws crowds. The latter saves souls..."
LOVED this! I came to God through a very interesting path which mostly was due to my issues and past traumas. Christians were really nice to me and had great intentions on making me feel better about this and that but I wasn't told much about my rebellion. I memorized verses that secured my salvation and focused on getting others 'in' on the wonderful plan. "...the gospel demands and enables us to turn from our sin, to take up our cross, to die to ourselves, and to follow Jesus. These are the terms and phrases we see in the Bible. And salvation now consists of a deep wrestling with our souls with the sinfulness of our hearts, the depths of our depravity, and the desperation of our need for his grace. Jesus is no longer one to be accepted or invited in but one who is infinitely worthy of our immediate and total surrender." LOVED this, too. I immediately thought of the movie Phonebooth when I read this. Sometimes I wish God would put my in a phonebooth situation just so I can rip through all the crap of my life and just be honest. The summary of the movie is a guy gets caught in a phone booth by a sniper who plays with his mind and wants him to confess to his wife and assistant that he is fake. The guy, like most of us, denies the accusations and would rather be shot in the street than confess who we really are to people close to us. The sniper just wanted him to be honest with himself and others. So was he the pro or the antagonist? I am so bless that I have a wife that I don't have to hide; she knows it all. I still find myself wanting to hide myself from God and everyone else. Jesus is no longer to be accepted or invited!!!! There is no such concept in Scripture! I could do more on Chapter 2 but I doubt anyone has read this far. Chapter 3, here I come. I'm a Christian, Husband, Father, and Educator. This blog will have entries on all of that and more.